Craftable items can now be inspected prior to making them so you can learn more about what would be created beyond just the name. Various UI sounds added to crafting page. Aux items no longer use the Y button for second action. Aux items only have a primary action now. Objects that support interaction can now use the Y button for context-specific features. Turrets use the Y button to "Recover turret" to inventory, allowing players to pick them back up after placing them for reuse. The first cargo pod mission now has a turret placed by the pod for the player to grab for later. The crafting mission after the first cargo pod now just requires the player to make a scanner. Here's a screenshot of the craft inspection at work. 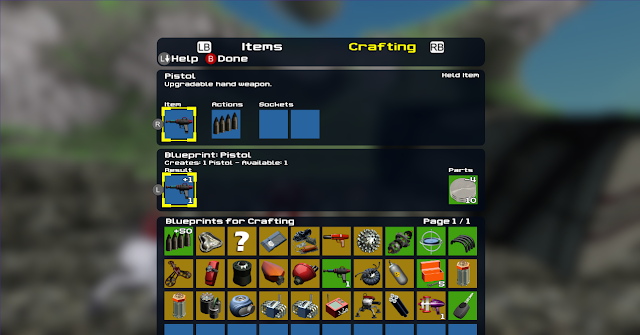 The Pistol blueprint has been selected, and then it was inspected to see the details of the pistol object. The pistol details shows the item itself, the actions it can trigger (in this case, one) and two sockets for upgrades. Upgrades have the potential to add an additional triggered action or passive effect on the player.